With good reasons i can say that archaeology has helped us have an in-depth understanding about a lot of things around us, at some point it also gives us some sort of a hint on how to improve them let's say Electricity. 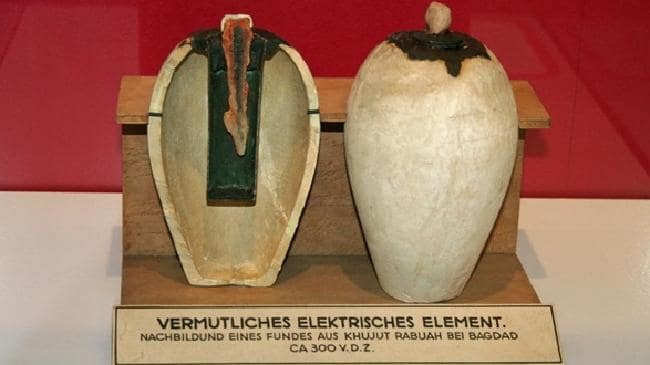 When we think of electricity, we recall Benjamin Franklin and his metal key-kite discovery in 1752 but what if electricity existed before the Benjamin Franklin's discovery like about 2000 years earlier, that's a very big time difference and that brings up this summary facts about the Baghdad battery. Discovered in Khujut Rabu, Iraq near the metropolis of Ctesiphon , the capital of the Parthian around 250 BC and 224 AD which the battery was said to be originated from but has the pottery style of the Sassanid period 224-640 AD. 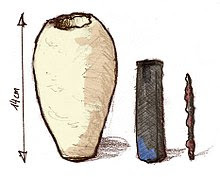 The artifact was a 130mm terracotta pot, in it was a cylinder made of rolled copper sheets with a single iron rod in the middle. The top of the iron rod was isolated from the cylinder by bitumen and had stoppers, the cylinder wasn't watertight so any liquid added to the pot will eventually touch the rod as well. Researchers hypothesized that this artifact was a galvanic cell used for electrotherapy or electroplating but there wasn't any electrogilded object from the time period it was built. Battery hypothesis and research proved the artifact wasn't useful as a battery because bubbles form a partial insulation of electrode due to the gas evolved in the iron,copper, electrolytes junction so the battery's efficiency decreases the more it is used and the voltage created by that combination is below 1 volt. Again, if the bitumen seal was supposed to serve as an insulator it would be very inconvenient for a galvanic cell because it's thermoplastic and require constant topping if they planned to use it for long. This artifact was initially mistaken to be another known artifact, The Seleucia vessels used for storing sacred scrolls because they looked identical. No one has fully understood this Baghdad artifact, its actual origin and purpose is still unclear. Let me hear your speculations in the comment section. Still on the archaeological aspects of mystery. As the saying goes there's nothing hidden under the sun or with time we shall know the truth but most times, Time itself doesn't always shed light on some certain things that happen around us. They just remain unexplained forever. So here i'll be talking about a mystery location that was the main target for treasure hunters, still is for some but majority of them gave up as they were convinced that there was nothing there or that whatever treasure was buried there, its now long gone. Coast of Nova Scotia, Eastern Canada. 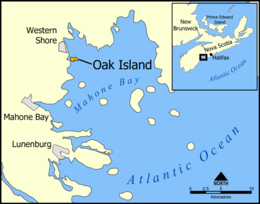 Many treasure Hunter and archaeologists travel from far and wide to visit Oak Island formally known as Smith's island, a name it got from one of the early settlers, Edward Smith. Oak island is famous because of its mystery money pit, a formation of nolan's cross, triangle shaped swamp and the beach at smith's cove. The money pit has been an area of interest for a lot of people according to researches, excavation and investigation on the area started as early as 1850. From Analysis, the construction of the money pit was around 1795 and after almost two centuries of excavation no treasure was found only fascinating mechanisms, wooden platforms, multiple underground canals with leads to water. According to the story told by the locals, earlier excavation of the area at about 90 foot below there was a stone tablet which was inscribed with words "forty feet below, two million pounds lies beneath" but if something like that existed in the pit it means that there was some sort of riches there but then again, early excavators might have grabbed it all. The money pit is still been repeatedly excavated in search for riches in abundant. Even former president Franklin Delano Roosevelt once joined few Harvard graduates in excavating the area. 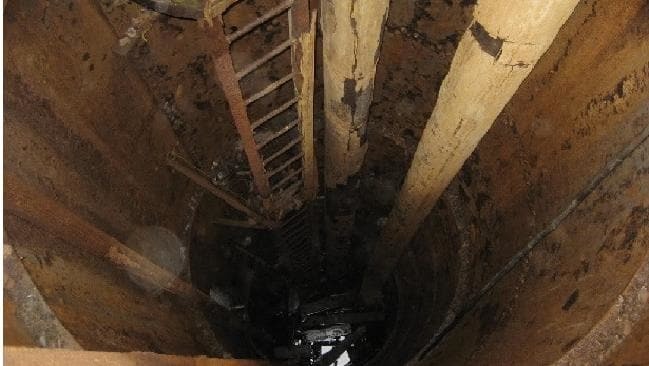 Critics argue that there are no treasure buried down there, saying the pit was a natural occurrence, there may not be any treasure in the pit but from the looks of it that pit definitely didn't occur naturally. So, till today people still don't know any facts about its creation or its real purpose. Do you really think it was actually created for storing treasures or something else entirely? Let me know in the comments section. Just as we are vaguely familiar with some of the mysteries of the world, as popular as they may be there are still unanswered questions about their origins or the purpose why they were created. The moai statues in Easter island are one of the most popular wonders on earth but there are some facts about them which people still can't wrap their head around. Easter 1722, Dutch explorers discovered a very remote island called Rapa Nui while they were searching for a hypothetical land, Terra Australis but found Easter island instead. Rapa Nui was renamed Easter Island by the explorers because of the day it was discovered, they were surprised to find at least 2000 to 3000 people inhabiting the island because it was isolated from any other inhabited land about 1,200 miles from the nearest inhabited area and 2,300 miles from the coast of Chile. The most interesting thing about Easter island are the Moai statues, these statues (887 of them, Wow! ) are so massive weighing up to 75 tons and about 40 feet(12 meters) tall. The statues had a red soft stone shaped like a hat called Pukao. Another interesting thing about these statues is how they were transported, from research the people of Rapa Nui used hand built sleds, rollers and ropes to move these huge statues around but attempts to recreate these methods resulted in damaging the statues but according to Hunt and Lipo's book "The Statues That Walked" provided more concrete evidence that the statues were moved vertically. Radiocarbon analysis indicates that the island was first inhabited around A.D 1200 by the Polynesians who voyaged to the east Pacific which according to legends were led by a chief Hotu Matu'a, their main place of origin is still unknown. 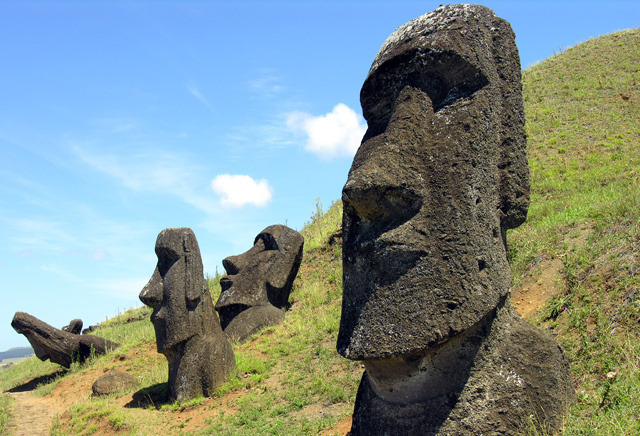 According to ancient stories, the moai statues walked from the creation place to their platforms called Ahu. The statues was built ringing the whole island and had all the statues facing inwards the island which also led to the belief that the moai was created to honor deities and the people of Rapa Nui, the construction of the moai statues stopped around the time the European explorers discovered the island, the reason why they stopped is still unclear but stories were that the people of Easter island were infected by a disease contacted from the explorers. Today, the Moai statues has grown very popular amongst historians and many other statues has been erected on their initial ahu base but its main purpose and why its construction was ceased is still a mystery. Let me know your thoughts on this incredible artifacts. Where Is The Confederate Gold? Araras. The Brazilian Village Of Vampires? © 2018 Mysterydiari. All rights reserved.